The Treasury Bond ETF is below its second quarter risky level at $126.41, which is the high end of a trading range. 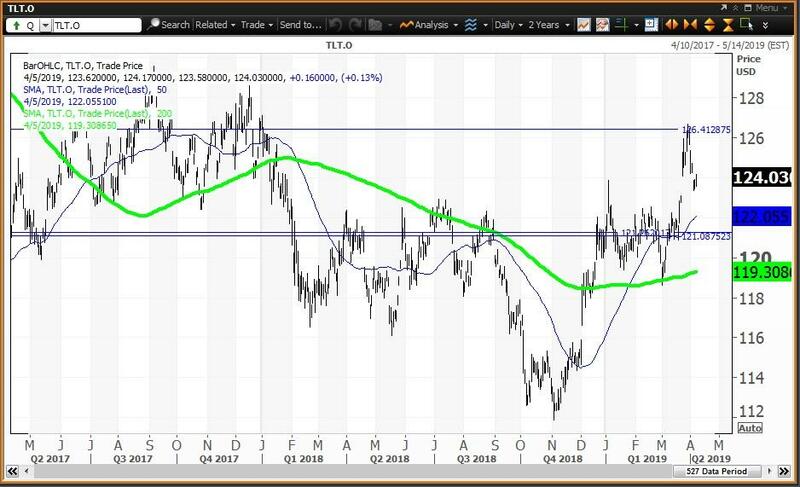 The Utilities Sector ETF set its all-time high at $59.07 on March 27 as the upper end of its trading range just exceeded its annual risky level at $58.98. The High Yield Bond ETF sets fresh 2019 high of $35.99, which is a test of its “reversion to the mean” at $35.99. The yield on the 30-year Treasury bond traded as low as 2.791% on March 28, well below its 200-day simple moving average at 3.104%, setting a trading range. The semiannual and monthly value levels are 3.052% and 3.062%, respectively, with a quarterly pivot at 2.813%. The utilities stock ETF offers a dividend yield of just 2.96% below 3%, which makes XLU no longer attractive as a "flight to safety" investment. Go for the "Dogs of the Dow" instead. The junk bond ETF is above its 200-day SMA at $35.35 and tested its 200-week SMA at $35.99. This ETF has been below its 200-week simple moving average since the week of Nov. 14, 2014. The U.S. Treasury 30-Year Bond ETF trades like a stock and is a basket of U.S. Treasury bonds with maturities of 20+ years to 30 years. As a stock-type investment it never matures, and interest income is converted to periodic dividend payments. The Treasury Bond ETF ($124.03 on April 5) is up 2.1% so far in 2019 and set its 2019 high of $126.69 on March 28. This ETF is up 10.8% from its 2018 low of $111.90 set on Nov. 2. TLT has a positive weekly chart with the ETF above its five-week modified moving average of $122.90 and above its 200-week simple moving average or "reversion to the mean" at $123.93. The 12x3x3 weekly slow stochastic reading rose to 74.06 60 last week, up from 68.18 55 on March 29. Investor Strategy: Buy weakness to semiannual and monthly value levels at $121.37 and $121.09, respectively, and reduce holdings on strength to quarterly risky level is $126.41. The Utility Stock ETF ($58.10 on April 5) is up 9.8% so far in 2019 and is 14.3% above its Dec. 26 low of $50.81. XLU has a positive but overbought weekly chart with the ETF above its 5-week modified moving average at $57.26 and well above its 200-week simple moving average or "reversion to the mean" at $50.23. The 12x3x3 weekly slow stochastic rose to 90.33 last week, up from 90.39 on March 29, moving further above the overbought threshold of 80.00. The sentiment reading is now above 90.00 as the Utilities ETF becomes an "inflating parabolic bubble." 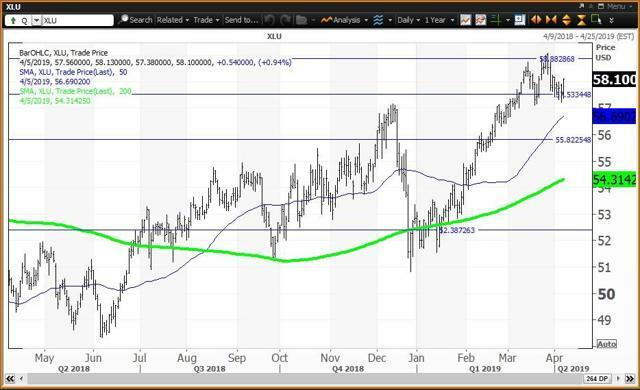 Investor Strategy: Investors should buy weakness to its semiannual pivot at $52.38 and to the 200-week SMA at $50.23 and reduce holdings on strength to its annual risky level at $58.98. I show monthly and quarterly pivots in between at $57.53 and $55.82, respectively. The Junk Bond ETF ($35.97 on April 5) is up 7.16% so far in 2019 and is 9.3% above its Dec. 26 low of $32.92. 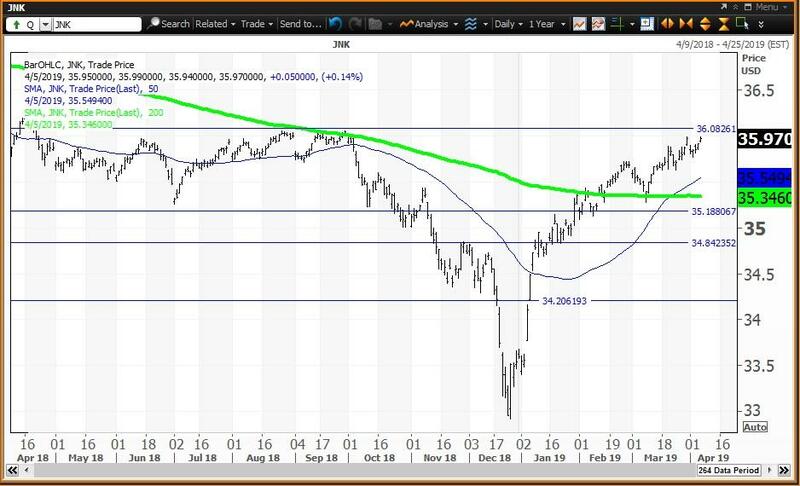 JNK has a positive but overbought weekly chart with the ETF above its five-week modified moving average at $35.60 and testing its 200-week simple moving average or "reversion to the mean" at $35.99. The 12x3x3 weekly slow stochastic reading rose to 97.79 last week, up from 93.83 on March 29, maintaining the status of an "inflating parabolic bubble" with a reading above 90.00. Investor Strategy: Buy weakness to its quarterly, monthly, annual and semiannual value levels of $35.18, $34.84, $34.20 and $32.74, respectively, and reduce holdings on strength weekly risky level at $36.08.